On April 20th, I had the opportunity to attend the Nihon Buyo lecture and performance hosted by the University of Washington and featuring Fujima Rankoh and Mark Oshima. Fujima Rankoh is a renowned dancer with the Fujima School of classical dance. He began studying dance at age 5, debuted on stage at age 6, and received the professional title of Fujima Rankoh at age 16. 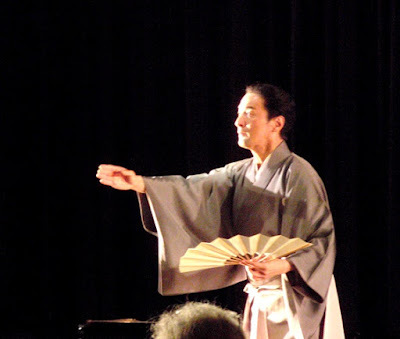 He has also studied nagauta music (Kineya), noh (Komparu), tea ceremony (Urasenke), and Hayashi accompaniment music for which he received the professional title of Kiyoshi Tosha. 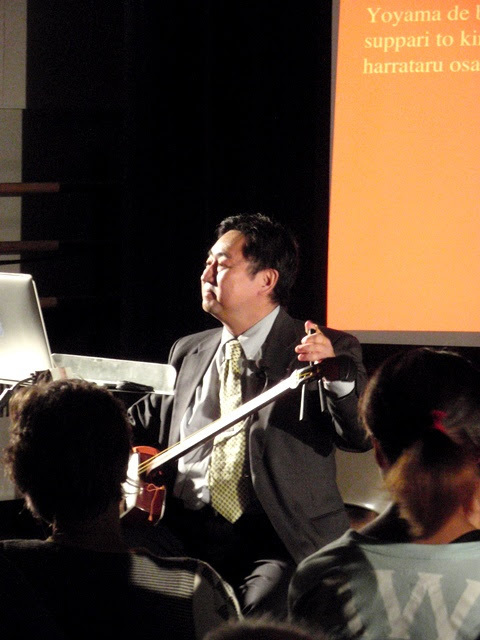 Mark Oshima is a kabuki researcher, author, and translator. He has received the professional title of Fujima Toyoaki with Fujima School of classical dance and Kiyomoto Shimadayu with Kiyomoto School of music. 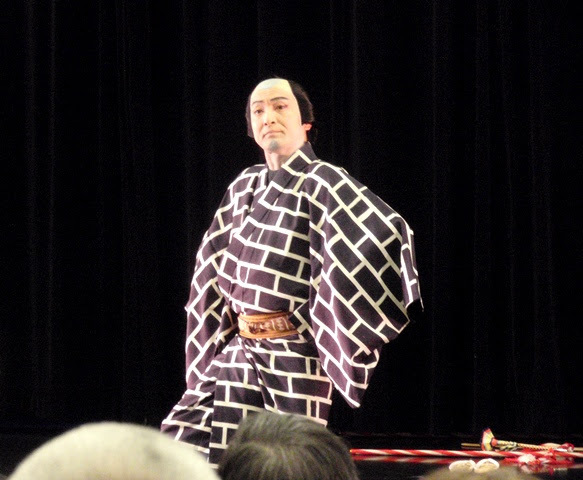 In addition to performing on stage as a kabuki singer, his work includes providing translation for the Kabuki-za and National Theatre English Language devices and for NHK World's Kabuki Kool program. The event began with a brief welcome and introduction by Ken Tadashi Oshima (Architecure professor, UW Japan Studies Program chair). Mark Oshima provided a a detailed overview of nihon buyo (classical Japanese dance) accompanied by performances of two dances by Fujima Rankoh. The term "nihon buyo" was invented relatively recently in the 19th century to encompass traditional dance forms including mai (circling dances like noh), jiuta-mai (dances performed by geisha and maiko), and odori (high-stepping dances like Bon Odori). Nihon, as you may know, refers to Japan and buyo is a combination of the characters for mai (舞, also pronounced "bu") and odori (踊, also pronounced "yō"). Over half of nihon buyo is kabuki buyo. It's interesting to note that, though women do not perform on the kabuki stage, most buyo performers are women. The first performance was Yamagaeri (Returning from a Pilgrimage to Mt. Oyama), a kabuki dance accompanied by Kiyomoto narrative music and performed with full costume, makeup, and props. The setting is Mt. Oyama near Edo, a popular site for pilgrimages which often doubled as an excuse to get away and play. This dance centers around a young fireman describing his visit and brief romantic encounter. Utamono is lyrical music like Nagauta. Kutarimono is narrative music like Kiyomoto. Japanese music must be sung in Japanese due to the distinct syllables. "A" and "aa" are two different words, so a fushi or joint is added to lengthen. It's understood that the fushi has no meaning and is just music. Utamono is word based with melodies and rhythm. Kutarimono is entirely word-based and is difficult to dance to. The moves and music aren't in measures, so live dancers and musicians must interact on stage. Mark performed a Kutarimono piece with shamisen. The second dance was Miyakodori (Capital Birds), a su odori performed in formal kimono with no makeup and only a fan as a prop. 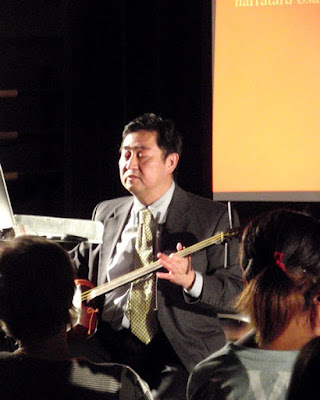 This is a piece composed by Tomeiryu founder, Hiraoka Ginshu, a famous engineer who came to America to study trains and created Tomeiryu by altering and refining shamisen, creating traditional music suited to the refinements. The title of the piece is a reference to poet Ariwara no Narihira who, while crossing the Sumida river during his exile from Kyoto to Tokyo, spotted white birds flying overhead and named them "miyakodori" (birds from Kyoto). Along with the Sumida river, they have become a symbol of longing for someone who isn't there. Though this specific dance does not have a story behind it, there is a famous Noh play about a woman slowly going mad as she tries to find her kidnapped son. She sees the white birds and thinks of the poet, then hears the story of a boy dying while traveling with slave traders and realizes this must have been her son. As she prays, she thinks she hears her son's voice in the cries of the birds and sees him in the swaying of a willow tree. The event concluded with a Q&A. Mark, with demonstrations by Rankoh, explained how movements in nihon buyo such as rocking can indicate being on a small boat and how a fan take the place of many props, being pulled like and oar or held like a pipe. 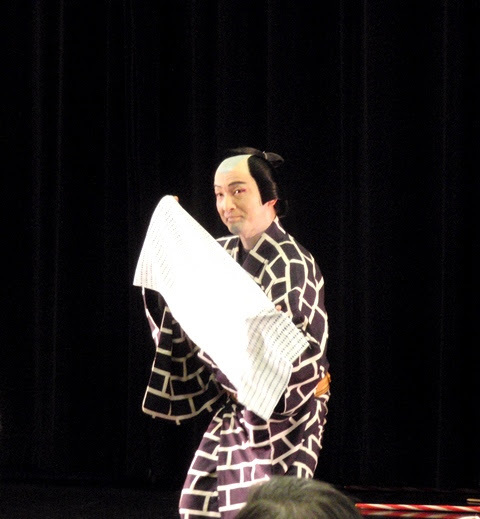 If you happen to be in Portland on May 30th, PSU will hold their spring kabuki production of The Castle Tower and The Puppeteer, both entirely in English and featuring music by Mark Oshima.